BBC NEWS | Programmes | Politics Show | 'Mine's a pint,' or is it? 'Mine's a pint,' or is it? Does it all depend on the type of ale you drink? When is a pint of ale not a pint of ale? 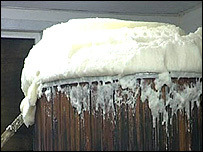 According to the Campaign for Real Ale (Camra), it is when there is a large head of froth on it. Then, so they say, it's no longer a pint of liquid and therefore becomes a short measure. 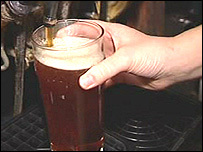 In February 2005, the Politics Show reported on an Early Day Motion, that called for legislation to define a pint as 100% liquid. Today, there are renewed calls for the government to ensure that customers are automatically entitled to a whole pint of beer. Is a pint any closer to being a pint? 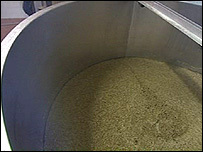 If even the slightest percentage of the glass is froth then Camra says it is no longer technically a pint of beer. Is this all froth - or is there beer below? "It's costing drinkers so much, it's costing us more than a million pounds a day, in beer that we're paying for and not receiving. "That doesn't apply to any other purchase that you make. If you bought a 100-piece jigsaw and there were five pieces missing - you would take it back. "If you bought half a dozen eggs and one of them was missing - you would go back to the supermarket and complain." Over a thousand days later...Camra is still waiting for a change in the law. Current guidelines state that a pint only has to be 95% liquid. Camra is renewing the pressure on the government to legislate, so a pint of ale means a pint of liquid. So far, 21,000 people have signed an online petition calling for new legislation. "If they change the legislation," he said, "and they state that a pint of beer bought in a pub should be 100% liquid, then if you are served less than a pint the law is on your side. 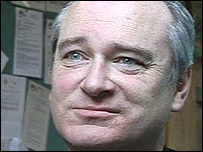 At the moment there seems to be reluctance to enforce that." 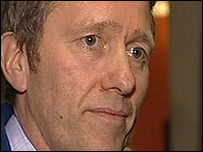 In 2005, the government told the Politics Show that there had been three separate consultations on the issue, but a way forward which balanced the interests of all parties had not proved possible. "The licensed trade has in place guidelines which recommend that not less than 95% liquid should be served in all circumstances and that customers should be given a top-up if they are dissatisfied with the measures they are served. We are continuing to observe the effectiveness of the trade guidelines". That line is backed up by the trade body, The British Beer & Pub Association, which says a top-up should be easily achieved without issue or hassle. But there is support for Camra's campaign in the House of Commons - most notably from the All-Party Parliamentary Beer Group. "One of the suggestions made over the years, is that the pint glass should be slightly more than a pint and have a white line drawn round it where the pint actually reaches - you then have the head on top of that. "That might seem a logical conclusion, but not many beer drinkers like those glasses and I don't think that is actually the way to resolve the issue. "I think the industry believes this isn't a seriously large problem and that where people do have a particular issue they just raise it with the publican, but nevertheless there is an issue here - a pint is a pint," he insisted. Until such time as the government legislates that a pint is 100% liquid and the froth an added extra, it seems it is down to the customer to make the difference. If you don't want a head of froth on your beer, then you will have to ask for that top-up. E-mail us in the online e-mail form below and let us know what you think. The Politics Show for the South West, with Jon Sopel and Chris Rogers on Sunday 03 February at 12:00 GMT on BBC One.